I have been an avid openSUSE user in the past as it worked perfectly on my main workstation. However, I switched to Xubuntu as I'm more obsessed with speed and simplicity nowadays more than anything else. Since the latest version of openSUSE is about to be released and it promises some major enhancements over its predecessor, I decided to take a look at my former favorite distro to see what's been going on. openSUSE 11 (Release Candidate) is out already, so it's the one that I grabbed. At first, I was still contemplating on which flavor to get since openSUSE is available in both Gnome and KDE Live CD versions. I usually go for GNOME, but this time I got the KDE 32-bit edition. My main reason for this is that I wanted to finally try out the much talked about KDE 4. This is the part where I'm really impressed. The installation was very straightforward that I think even my grandma can figure it out. The process is very simple and it only requires a few steps to get the system fully installed. 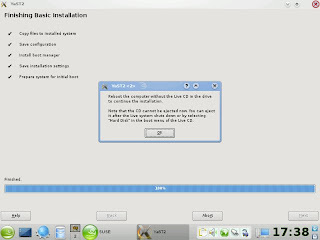 Here's my openSUSE 11 installation walkthrough -- The Live CD set-up kicks off after clicking the "install" icon, of course. The "Yast Installer" welcome screen will then open where you can set the "Language" and the "Keyboard layout". You will also have to agree to the "License Term" to go on. 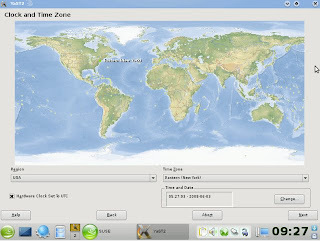 Then, you will have set the "Clock and Time Zone", followed by the easy "Partitioning". I said easy because there's already a suggested partition and you can just use it if it suits you. The last step is creating a new user, and then you will be given an option to double-check before the "Live" image can be copied to the hard drive. After the installation, you will have to reboot to use your newly installed system. -- Simple as that. This is the interesting part. Almost all those who have used the most previous versions of openSUSE can definitely notice its trademark elegant and professional-looking themes and artworks. 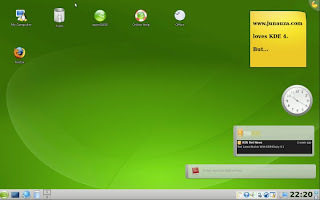 openSUSE 11 is no different and can surely satisfy those who loves a beautiful looking desktop. Everything looks polished -- the grub menu screen, the boot image, the login menu screen, and the default wallpaper. Now let's talk about KDE 4. I'm not really a big fan of the K Desktop Environment as I've always said before. However, after having used KDE 4 in openSuSE 11, I must say that I'm loving it, although not totally. KDE 4 looked stunning indeed, and the good thing is that it didn't sacrifice "speed". It is very responsive even when running in VM (Virtual Machine) environment. If you have a not-so-old machine and want to experience desktop bling, then KDE 4 might satisfy your desire. It's true that KDE 4 is still quite buggy as I've encountered some of its minor glitches, but I think it's pretty much usable and stable enough for daily and productive use. 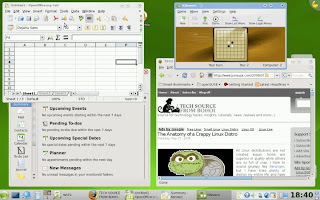 openSUSE 11 is packed with plenty of important free and open source software. To name some, there's Firefox 3 (Beta 5) web browser, Kopete IM, OpenOffice.org office suite, Amarok audio player, Gwenview image viewer, and plenty more. I'm a little bit disappointed that GIMP was not included out-of-the-box, so I downloaded and installed it with the help of Yast graphical installer. I also installed the non-oss "flash player" for watching flash-based videos on the web. Installing, removing, and updating software packages through Yast is hassle-free. To get additional packages, you have to enable the software repositories first, and then just search for the applications that you want. You can also easily browse for installed or available packages as they are well categorized. I must say that the Yast software installer has really improved through the years and has become much faster than before. In my own opinion, it's now almost as good as Synaptic Package Manager. openSUSE 11 worked perfectly well with the VM hardware as USB, CD-ROM, audio, and Ethernet were properly configured and were functioning immediately after the installation. SaX2 (YaST module used for configuring the X11 graphics system) worked flawlessly after I've tweak my screen resolution and other graphics options to my preferred settings. I also want to point out the faster boot/start-up speed of this new version. However, as noted on the release announcement, OpenSUSE RC1 is not yet fully cooked and has still some issues that need to be fixed. Based on my brief but thorough experience using openSUSE 11 (RC1), I'm expecting a very solid release for this Novell-sponsored Linux distribution. If those minor bugs that I've encountered will be ironed out before the release day comes, then this is going to be the best openSUSE version ever. Does it have what it takes to beat Ubuntu on the desktop? -- openSUSE has always been a distro of choice for mainstream and new-to-Linux users for so many years now, hence overtaking Ubuntu is not far from reality. If openSUSE 11 can deliver the goods at the right time, who knows, I might give it another chance. 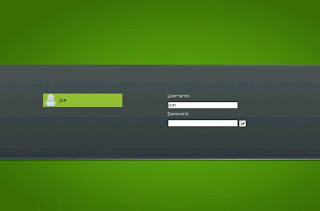 openSuSe 11 surely looks good based on the screenshots. I'll download the stable version once it's released. I'm looking forward for the day that openSuSE will beat Ubuntu on the desktop. The thing that I didn't like about OpenSuse last time I tried it was the rpm-based package management. Synaptic is a must for me. Synaptic is just a front-end for the apt-get package management system. 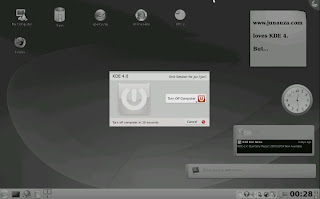 Synaptic can be used with rpm-based distros (such as pclinuxos). In fact, apt-get is just a front-end for dpkg I think, and you can rig apt-get to use rpms. Debian-based distros do have big repositories (18k+ packages). I have heard that package management is working much better in opensuse nowadays. I have tried OpenSuse 10.3 for about a month, then dumped it when Fedora 9 was released. One thing I didn't like about it is its application installer. I don't know, maybe its repositories is just too limited. Anyway, I'm willing to give it a try someday, as long as the final release is out. I admit that openSUSE 11 looks like a great distro, I have been playing with it since early alphas and a lot of work has gone in to the last couple of releases. But what do you think of the whole Novell/MS thing, especially with regards to Mono and Moonlight? Is that enough to put you off? Looking eagerly forward to 11.0 release. Regarding the package management, well zypper is now probably single most powerful and fast package manager, even compared to apt-get. Yes, when combined with front-end, Yast+zypper, guess Synaptics+apt-get is faster, though management has been as well enhanced with Yast. The new zypper in openSuse11 is supposed to be very fast, which is about the only problem there has been before, I have always thought Yast software installer as very good albeit not very fast. Zypper resembles the apt-get as it is also command line tool, though I am not sure what is the GUI using zypper. OpenSUSE is tainted by the stink of Microsoft. I'm one of the idiots that believe Suse is the Linux Whore. The deal with Microsoft is old news but as long as the deal exists Suse is leper. Stay away from it people. I can't forget about the deal when Novell reminds me all the time about how protected its customers are. I don't want to be patent protected. I want to be free. I might be an idiot but it is better than being a slave. "The Software may contain an automatic disabling mechanism that prevents its use after a certain period of time, so You should back up Your system and takeother measures to prevent any loss of files or data." I mean, in a frakking Linux distribution? They can stick it you know where. As with the EULA thing, that really is freaky. Novell should make a comment on that one. The EULA has quite a few restrictions in it. I'm hoping that Novell's EULA for OpenSuse changes (note that at the top the license is "Pre-Released Software License"). benchmark test of the Software." Then it goes on to say that if you do anyways, Novell holds the right to benchmark and release the information of the vendor who benchmarked them. Then there's the General terms, which states that you the "Beta Agreement" will terminate if a newer pre-release version comes out or if Novell releases a commercial shipment of the product, and that You MUST CEASE USE OF THE SOFTWARE, RETURN TO AN ORIGINAL STATE OF ANY ACTIONS PERFORMED BY THE SOFTWARE, DESTROY THE ORIGINAL AND ALL COPIES OF THE SOFTWARE OR RETURN THEM TO NOVELL, AND DELETE THE SOFTWARE ENTIRELY FROM YOUR SYSTEMS. Just a little web browsing reveals that Novell are doing a LOT of open source work including major projects like OpenOffice.org, Evolution, Gnome, etc. They've open sourced many previously closed projects such as Yast and OpenSuse itself. I would turn to reason rather than emotion when evaluating Novell's Open Source efforts. I realise that Microsoft's scorpion like shaking of hands while wielding a venomous tail has many of us feeling betrayed but at some point we need to focus our energies and attention on the continued rapid evolution of Open Source software instead of wasting time on how not to develop software. I am everything but a Microsoft fan but as the marketing folk say "All publicity is good publicity". I suggest we leave MS to either adapt (and play nice) or DIE. don't do this "is X the Y killer?" thing. It's like canibalism. I have used SuSE up until Ubuntu 7.10 and the purchase of my Thinkpad T61p. There simply was no way SuSE could be brought to work on that hardware. I will give it another try when 11 gets out. Happy to hear that YAST is getting faster. Always dreaded having to use YAST. at the office i use 10.3 at home i use ubuntu on my laptop. I'm all penguin at heart. The real problem is this internal competition between linux distros. It's to bad that all these organizations sponsoring linux can't come up with 1 linux distro. Until that happens MS will continue to control the desktop environments. Stop competing with each other and start working together Unification is the secret to taking the desktop war. openSuse is definitely an Ubuntu killer. Which distro isn't? People that are still arguing rpm vs deb, ms+novell deal, etc. Get over yourselves. apt-get is nice, but I've seen more innovative ideas going on with different package managers. The fact is Suse is pushing out innovations that all linux distros are using. And if you want to talk about what stinks, talk about Ubuntu+Canonical. Why don't the opensource their proprietary tools? Linux for humans??? Give me a break. Linux for humans that are gluttons for punishment. In the end Canonical is making a business investment and at some point they are expecting returns. Sorry, but to me many Ubuntu users are still old windows user with the same lame excuses. 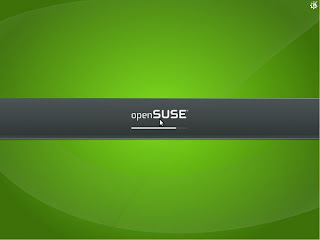 openSuse. Nice job! Keep it up! I disagree michael. Unified working together as you mentioned is correct, but having a single distro is killing the ability to innovate and come up with unique methods of doing things. then the users or thing and work and create alike. No room for innovation. More division or distros is what helps the cause on the long front. Competing with MS is not the answer. They all have different goals. Smart, dumb or any other type of people should be allowed to use whatever OS they choose. Not forced to conform to a status quo that may be horrible for them. So I say let there be more distros. Another note; With as many distros as we have, they are all linux and share certain similarities. I really see five types of linux at the most. Nobody seems to mind Ubuntu using it's closed source bug program....or the fact that it wants everyone to sync releases and use the same bug program (theirs) so that it's easier to work. But they left the part out where you have to pay for it. I'm telling you....Mark is the Bill Gates of Linux.....He's just going to earn his money from the development software. Some of you are just plain naive. Its not about who has done "great work" for open source or who had contributed. In the end all that great work and contribution if for nothing if you end up destroying the project. Just read the poisonous people article about Subversion. You all will ignore the possibility that Novell could help MS destroy Linux just because they gave you some free handouts? Good grief...grow up people. This isn't to say Novell has malicious intent but only a fool would just look over it. If it turns out to be a true plot and the manage to wreck the community THEN where will you be?...scratching your heads wondering how you got the wool pulled over your eyes. 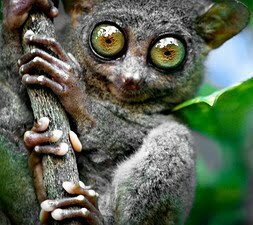 OpenSuSE looks great but until certain people and their intents are made clear...especially around projects like Moonlight and Mono then I would advise people to tread cautiously. Put your silly distro pride aside for a second and think. Canonical may not give back the way you think they should but they aren't injecting code from a company that is threatening to sue into the Linux community. I installed the first beta release (64-bit version) to hdd, and was not impressed by how it blew away an fc8 install on another partition. Note that when I reinstalled fc8 back to that partition, it did not blow away suse. Manners. Some distros just get it. I ran suse 10.3 for a few months and it was pretty solid. The 11-beta did have some bugs (unsurprisingly), but the update manager was in a class of its own. I was unpleasantly surprised when it managed to delete both KDE4 and itself in one go, while I was attempting to upgrade to the next beta release, leaving me with a crippled KDE3.5 desktop no menu, but Firefox and a terminal accessible (I suppose that's something). An update manager that attempts to commit suicide, leaving behind a vegetable. That's a first in my experience. I started out using Linux by testing Mandrake, I think it was version 9 at that time but I stopped using it after my first try with SUSE. There have been ups and downs in the past few years but it seems to be only ups since openSuse 10.3 which I am still using. OpenSuse 11 has impressed my from the alpha days. The Alphas were so good that I knew even then that this would be a rock solid kick asses version. And since Ubuntu uses Gnome and Kubuntu is no good then even their butts won't be spared. ^Thats very true. SLED and OpenSuse are two different products, with different goals. I used to be along term Suse user v6.1 up to the time Novel bought them out. I was concerned about this event and history has proven my initial misgivings about the whole thing. They could have the best distro out there but I refuse to get into bed with the biggest Microslut on the planet. I will never even waste my time downloading their crap!!!!! Suse used to be my favorite distro but no longer. Oh and also I don't care for Ubuntu either but there are lots of others to choose from. I have read pretty extensively on the whole Microsoft-Novell deal thing. It appears that while MS is cunning (and was likely aiming to trap the FOSS community), they actually got hustled by Novell. With the new version of the GPL, the protection granted to the Novell end users would be extended to all end users of software distributed under GPLv3. they actually got hustled by Novell. With the new version of the GPL, the protection granted to the Novell end users would be extended to all end users of software distributed under GPLv3. Where is this analysis? I don't think Microsoft's lawyers would agree with it. i find opensuse 11rc really good. but i am still waiting for sled xi to deploy in my office. if i m right sled will pick up things from opensuse and make it enterprise ready. as it was mentioned Novell also is one of the major contributors to OpenOffice, Gnome and MANY other open source projects! if you are so true to your beliefs I dare you to refuse using OpenOffice and any project related to Novell! Tried out SUSE 11.0 with Gnome. Font hinting is still as bad as earlier SUSE versions. In fact, it has the worst font compared to Ubuntu 8.04, Fedora 9, Mandriva 2008.1. 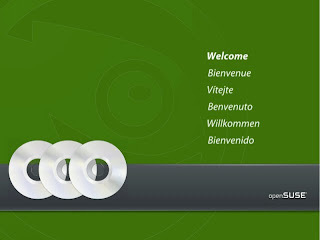 SUSE has spent lots of effort to deliver impressive eye candies - icons, colors, graphics, etc. But ultimately these are not as important has having smooth fonts display that ease the use of computers. Overall, Linux distributions are still struggling with getting consistent and usable fonts done correctly even till today. And it's a petty to see lots of users wasting lots of time tweaking displays, system setup, source codes, etc just to get fonts working to their expectation. Is using Linux has to be that hard and painful compared to using Windows and Mac? - Many packages on openSUSE have to be searched through web instead of package manager. Ubuntu wins there, to. - Try to run a program from the CLI that hasn't been installed yet. Ubuntu tells you what package contains that program and how to install it. OpenSUSE just tells you it doesn't have that program installed. - Similar thing with video. I tried to view some FLV videos, Ubuntu offers me to install the necessary plugin(s). openSUSE just says "sorry" and closes the application (totem in this case). - One thing has improved in openSUSE with respect to previous version. For example, if you want to install gvim, there is one metapackage, something Ubuntu had for a long time. In the past, I had to chase several packages untill I got gvim working. Gvim is not the only example, I just can't remember the other ones right now. To all you dudes complaining about the EULA - I want to say that the URL posted by someone anonymous which mentions a *disabling mechanism* - IT IS FOR PRE RELEASE VERSION OF OpenSUSE. The FINAL EULA on the public 11.0 version contains no such text. The old EULA from the pre-release versions probably has to do with ensuring that everyone migrates away from the beta test versions which (duh) won't be supported. Chill on the Micro$oft paranoia - as far as I'm concerned - if the stuff works and plays nice with other OS's, it's only a plus. 'Ataboy team SUSE! Woow.. its iteresting to see so many opinions. After SLED 10 and OPENSUSE 11 one can say that linux is ready for deployment within a managed environment. When i say managed i mean working along side other technologies and adaptability. But, on the other hand lINIX is in no way ready for the home market (Other than a managed environment like a HOME USER)they will go nuts. So far the closest as far as i know is SUSE. I less than a year i believe there will be heaps of organizatons moving into SUSE LINUX which eventually will bring home users to the light. ITS ALL ABOUT WHAT THE USER FEELS EASY and FAMILIARITY. openSUSE 11 rules and will only grow in power. The fact that Novell is now running the show and bringing an incredible commercial understanding and discipline is only going to help the Linux community realize what Torvalds and Linux are all about. People can hate Micro$oft all they want and Novell for collaborating with everyones' arch nemesis but, Microsoft has met every objective that they set down in the eighties. The real openness of Linux was not instituted for hatred but, for learning and keeping the tools out there for people to become acclimated with learning CIT. The Linux community has forgotten this fact and the community suffers for it. SUSE will always be my first pick in Linux, even though I don't care for the .rpm file management format. SUSE is, by the way, incorporating synaptic as well as apt get functionality in full scope. SUSE the total package is exactly what we need/want! I am an average linux user I think. I have worked through Ubuntu Studio, Then Kubuntu 64 bit edition, to finally Ubuntu Ultimate edition. Now true there is nothing ultimate about the ultimate edition just nice looks, and alot of pre-installed software. I am beginning to study for my linux+ cert. And in doing so I have to study and gain exp with Fedora, and Opensuse, or Mandriva. I personnaly like the looks of the new suse, but eye candy doesnt mean anything, without stability, compatibility, and reliability. I tried out the new PCLINUXOS as it was supposed to be very highly reccomended for new linux users, yet dropped it like a bad habit, when after my install, it could not read CD/DVD-ROMs, and wouldnt mount USB devices right off a clean install. Now like all great powers such as the Romans, and Greeks,... Microshaft's decadence will be its downfall. Its presumption of me or nothing will eventually come to and end as will all things in time. If someone, even Novell comes up with a way of making it so I dont have to have windows on my linux box at all to do my work and play games GREAT! I would only say just dont sell the soul of what attracts us all, and is the bragging point of what makes linux, Its soul,...its Freedom. I am always on the search for "the Distro" that will end my needs for using MS forever. In fact I only go back to MS when I have to due to a program or 2 requiring it. But even with the Great Ubuntu, I find short comings. I am extatic to see Linux distro's finally offered in competition with Winblows as the primary operating system, that is so cool it not even describable. I dont hate MS, I just like Linux better, as MS has a way of irritating me, kind of like a 9 year old asking me the same question 5 times on the same thing. you can install any of the above without internet, they include all the dependencies, just unzip the both files into a folder named MMP2008 and create a repository from that folder as a simple rpm folder in yast, then make a search in the yast installer with the name of the program and check it to install it, this is very important if you don`t have internet at home, and besides, by default Open Suse doesn`t include several codecs due to license matters. I just installed OpenSUSE 11 on my laptop this morning, apparently, they've finally fixed my only problem (my ATI Radeon Xpress 200M). After classes today, I'm going to set that up (and networking), It's looking to be a bright tomorrow for SuSE! Now if only someone could make a patch to fix the dependencey issues for the RPM packaging system. It and the seemingly a-typical issue most distros seem to have with using CD/DVD ROMS instead of the Internet. Thank you EASGS thats awesome. Could you send it to me possibly in chunks smaller than 2 mega bytes Via E-mail? I can download it normally. Ive talked with many people about the RPM system and the dependency issues seems to be the major and only complaint with using RPM based systems. Any ideas folks? PPC OpenSUSE for Macintosh G4/Dual Quicksliver is not the way to go. Ubuntu 8.04 Ubuntu actually works within 20 min... no other ppc os can claim that. I used opensuse 10.3 for 6 months at work. I got sick of vista. I dreaded using yast - it's too slow. I had to change distros because opensuse 11 changed the file compression method, which no longer worked on 10.3. I had to change distros then, and went with ubuntu 8.10. I'm trying kubuntu at home, but am struggling a bit with adept package manager. I'm trying to set up a file server for work with ubuntu server 8.04. If i can't get the server working, I may have to get ms server (yikes). I thought I had settled down with Ubuntu after trying it out for a few days. When I heard of OpenSuse, I gave it a shot and installed the version 11 (KDE). Wow! I was blown away! After a few tweakings, the look and feel is like Windows. And my java projects runs faster there too than on Ubuntu. My only gripe is I can't get my X41 tablet pc's functionality to work on it. Wish somebody can help me. please.. out there. I just moved from Ubuntu to openSUSE, and I can say with no doubt that I was deeply impressed! I think Yast is better than Synaptic in many ways, like repository selection from a list (no more searching the web for repos), all system settings in yast, server setups etc. The only bad thing about yast is that its slow when trying to view all packages in software management. Some application bugs in Ubuntu dont appear in the same apps in openSUSE (playlist in fullscreen in SMplayer). I set up an identical openSUSE system to my old ubuntu, in which i used terminal in many cases, without having to open terminal once!!! I was using Ubuntu for about 2 years before I decided to try openSUSE. Few program that bugged in Ubuntu works efficiently on openSUSE. No I'm stuck with opensuse for more than a month and I wish I'll stay with openSUSE!OpenSUSE awesome. IDK why Ubuntu was voted as the most popular distro ever while openSUSE is definitely better...IMO.